It’s raspberry season and the fruit is coming in splendidly. We’ll enjoy thimble sized berries now (first crop) for several weeks, and then again in the fall with the everbearing raspberries. They freeze beautifully and make marvelous jams. But nothing beats raspberry pie with rum-spiked ice cream. Mix together the flour and salt. Using your fingers or two knives, work the butter into the flour until it resembles small peas. Gradually blend in enough ice water to form moist clumps. Gather the dough into a ball; divide in half, then flatten each ball into discs. Wrap each of the discs in plastic and chill at least one hour or overnight. Pat one of the well-chilled dough balls out on a floured pastry cloth, wax paper, or parchment paper and then roll out into a disc. To make the dough easy to handle, fold it into quarters, lift, and set it into the pie tin, then trim the edges to fit. To make hand pies, cut the rolled disc in half or into quarters. In a large bowl, gently toss together the raspberries with the sugar to taste and turn into the prepared tin. 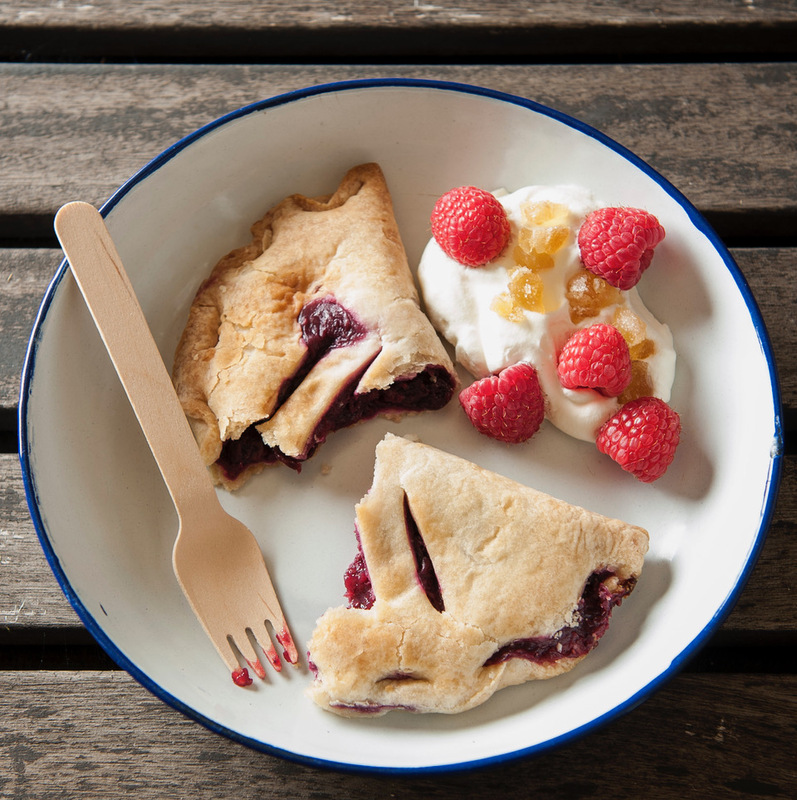 If making hand pies, place the fruit on the center of the circle or triangle and fold the dough over to make a pocket. (To make a double crust pie, pat and roll out the remaining dough ball and then fit on top of the filling. Cut to fit the top of the pie. Crimp the edges to form a border to seal the pie.) Make 2-inch slashes in the top crust starting near the edge and going toward the center of the pie to release steam as it bakes. Bake in a preheated 350 degrees Fahrenheit oven until the crust is golden brown and firm, and the juices have bubbled through the slashes, about 35 to 40 minutes for the hand pies. (A double crust pie will take about 50 minutes to 1 hour).